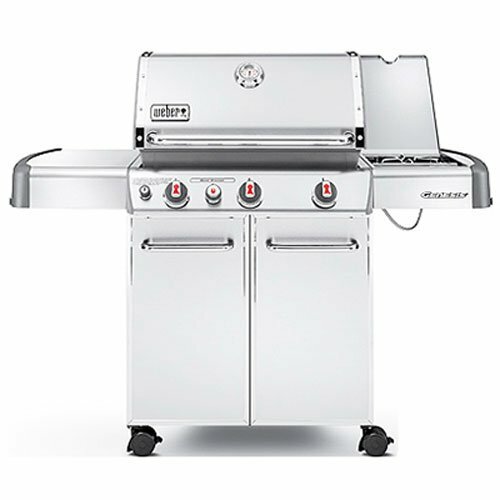 As part of the Genesis S series, Weber Genesis S-330 Liquid Propane Grill has a front-mounted control panel with three stainless-steel burners and an individual electronic ignition system. The unit offers a 38,000 BTU per hour input, and its total capacity consists of 637 square inches of cooking space (a 507-square-inch primary cooking area and a 130-square-inch warming rack). For added cooking space and delicious searing, the grill supplies a 12,000-BTU side burner and a 10,000-BTU Sear Station burner. The unit also includes stainless-steel cooking grates, stainless-steel Flavorizer bars, porcelain-enameled heat deflectors, and an enclosed cart with painted steel doors, stainless-steel handles, and a stainless-steel shroud with a center-mounted thermometer. Even more, it provides six tool hooks, two heavy-duty front-locking casters, and two heavy-duty back swivel casters. Requiring an LP tank to operate (not included), the gas grill measures 30 inches long by 60 inches wide by 64-1/2 inches high and carries a five-year limited warranty. 38,000 BTU per hour input main burners. Three stainless steel burners. Stainless steel shroud with a center mounted thermometer and accent colored cast aluminum end caps. Two stainless steel work surfaces. 507 sq. in. primary cooking area, 130 sq. in. warming rack area, 637 sq. in. total cooking area. 7 mm diameter stainless steel cooking grates. Stainless steel flavor Enclosed tank storage area and precision fuel gauge. Two heavy duty front locking swivel casters and two heavy duty back swivel casters. “This grill can do it all. Low heat, high heat, side burner, optional accessories, the list goes on. The way the burners are arranged makes it super versatile (front to back, not across the whole side), so you can use multi-heat zones. Easy to clean and take care of. The weight gauge for the propane tank is very accurate. I can’t say enough about this grill. “This grill works fabuously. Following the simple instructions that come on a single laminated card, we have been able to cook chicken and beef to a tender, juicy state. The convection, direct and sear cooking options work remarkably well. The construction of this grill is definitely first class. Everything is manufactured to fit perfectly. The grill box casting is very thick-walled and heavy, contributing to even cooking. The cleaning and grease collection are easy. The stainless steel, V-shaped channels, that cover each burner, very effectively vaporize the grease, contributing flavor to the cooking process while the top is down, and have eliminated flare-ups during grilling. The addition of the propane tank fill measurement should be very helpful.